Enclara has integrated E3 Mobile with its inaugural partner, Hospicelink, the industry’s most advanced DME Benefits Management Solution. This integration combines the most comprehensive pharmacy service provider with the nation’s largest network of DME providers, delivering a seamless mobile solution for ordering DME and pharmacy within the same Android or iOS app. Delivers a single app for ordering DME and pharmacy. Eliminates duplicate entry and inconsistency in patient records across systems through EMR integration. Streamlines the ordering process by transmitting orders from E3 Mobile to the selected HospiceLink Network DME Provider for quick delivery and pickup. Identifies Formulary and Non-Formulary designation for DME items and allows for control of the approval process. Access to patient demographic, medication, and DME equipment history and status. Increases efficiency and productivity for hospice staff, creating more time for patient engagement. Combines pharmacy and DME service line spend with Enclara’s real time analytic dashboards. 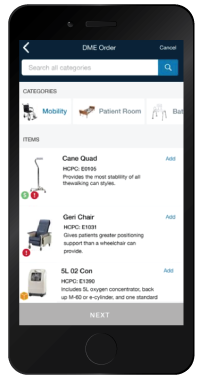 E3 Mobile provides nurses a better solution for managing patient care while on the go. Seamlessly order, track and manage all pharmacy, durable medical equipment (DME) and medical supply orders through a single app.